Yawn…so after 5 days of driving, drinking, swimming, and playing music, I have returned from the great little city of Missoula Montana. It is about a nine hour drive from Portland and we got in too late to catch much of the first night of shows. I will try to list just a few of the bands I did get to catch over the three days of festivities. There were so many I am sure I missed a few really good ones. We would like of course to thank our kind hosts Josh and Nicky for letting us sleep in their Totalfest campground, they are really great people and Wantage records has really helped create a great little music scene there. The music was mostly metal, punk and rock, which made it even more fun for us, as we were the only country band. This is partly due of course to Lana’s previous career as bassist for Last of the Juanitas, and her continued relationship with Wantage (they just released her new album). Here are the bands I saw and enjoyed. They play a mixture of post rock and metal…slow churned riff which will suddenly explode into a bowel shattering earthquake of metallic sludge. Great stuff. They are a Bellingham band relocated to Olympia Washington, and singer Justin told us they are trying to find a good venue to help build the scene there. I only caught about half of their set, but it was great, a mixture of old minimal pop/punk rock. Reminded me a bit of The Fall. Pierced Arrows play rock n’ roll the way it should be played. It’s not perfect, it’s not polished, but it’s honest and it will knock your socks off. Pierced Arrows rose from the ashes of the great band Dead Moon, and are one of the best rock bands I’ve seen in a while…they are out on tour now so check them out. Titan was an amazing metal band that lean into psychedelic territories. The band replaces the formulaic second guitar with a Juno synth which adds a lot of different texture to their massive…loud sound. The festival culminated with a reunion of sorts for the Bellingham band Federation X. I had heard of these guys before, but never seen them live. They are a three piece, and guitarist Ben Wilderhaus who currently lives in NYC actually sat in with us (Lana Rebel) on Lapsteel, as the mighty JT had another gig with his Headliners. Fed X stumbled a bit at the beginning with technical difficulties, but I’m pretty sure only they noticed as the crowd was far too busy moshing around and throwing beer at them. As the set progressed they gained momentum, and it really was a fitting end to a great little festival. Be sure to check out Wantage records, they have really solidified a great little northwest scene, and as somewhat an outsider/newcomer it was fun to be a prt of it all. Here are a few picts of our little adventure along the way, I hope you were there and had as much fun as we did! So I am off to Missoula Montana with the Lana Rebel band of Broken Promises to play at the DIY festival aptly named “Totalfest”. This should be a pretty fun time at a smaller up and coming festival put together by Wantage Records. Lana is also releasing her new CD, but we’ll be performing a Portland CD release party for that at the Kenton club in a couple of weeks, so I’ll add a separate post. Here is some official info on Totalfest. WÃ¤ntage USA and KBGA are teaming up to bring Total Fest VII to Missoula on Thursday through Saturday, Aug. 14-16. More than 40 original, independent bands are expected to draw fans from Missoula and around the region for the three-day music festival. The concerts begin at 8 p.m. each night at the Badlander/Palace, with a record swap planned from noon to 2 p.m. on Saturday at Big Dipper Ice Cream. This was listed over at BoingBoing today, but I will list it here to second my support for this great site, LP Cover Lover. It’s really a shame that cd’s came along and destroyed the art form that was the LP Cover. As a young musician and designer I always wanted to design album covers, but just missed the LP age, and alas I only had the opportunity to design some punk rock 7″ covers. You can waste quite a bit of time on this site going through their archives, and discover some real gems. I found this great folder of music my amigo Jason Willis had tossed my way a while back. It has old odd funk, soul, rock, and other just plain interesting stuff. I put together a muxtape list featuring some of my favorite cuts so far. *MUXTAPE WAS SHUT DOWN BY THE RIAA* you bogus morons!…that was a great site for discovering music, and a lot of fun. You could not even download music there. Damn those people just don’t understand do they? Last week Colt Vista played a Tuesday night gig at one of our most favored local Portland music venues Someday Lounge. The show was well attended for a Tuesday night, and we really played a great show, it was to steal a quote from our drummer Ryan “super fun times”. The reasons we like Someday Lounge so much are quite simple, professional soundguy (he’ll give you a great recording of the show for $20), good soundsystem, free beer chilled in the back room, and great food. The additional perk is the live streaming feed that actually works, so friends and family in far away places can view your show (they even archive them). After we played we were treated to a live performance from local Portland one man band Cars and Trains. 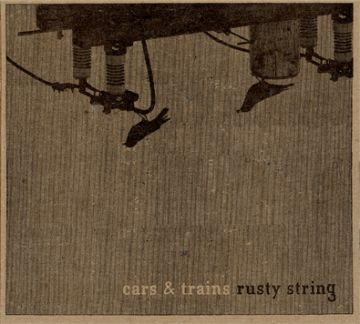 Cars and Trains is constructed and fronted solely by musician/designer Tom Filepp standing behind a large enviable collection of electronics and musical instruments. I spoke a bit with Tom before the show and we conversed a bit about writing performing with Ableton Live and how it is really opening doors for musicians. Tom later sent me a copy of his latest release titled “Rusty String” which you can purchase here. His live performance was very interesting to watch as he takes a loop and overdub approach building his layered songs and switching to other parts using live. I have wrestled with this approach a bit myself, as I feel it tends to take you away from the interaction with the audience, and while it is interesting for a musician such as myself to watch, I think the general audience member might need more…I’ve tried adding extra visual accompaniment in some of my projects, but that opens another can of worms…not to mention the time you need to create visuals that don’t come off as just being distracting from the music. Tom breaks it up a bit by adding other instruments to the mix nicely, it’s most impressive when he steps away and picks up a trumpet, or violin etc. and starts playing along with the constructs. He did one song that featured song great vocal overdubbing, creating a nice human textural element.